Here is a sample passage and some questions for you to try. Poor vision is a relatively widespread problem among humans. The most common vision defects include myopia, hyperopia, astigmatism, and presbyopia. Myopia is commonly called “nearsightedness” and is characterized by the ability to see only nearby objects while far-away objects appear blurry. The opposite of myopia is hyperopia, commonly called “farsightedness.” This is where the lens of the eye focuses images behind the retina, making nearby objects difficult to see. Astigmatism is a condition caused by an irregular cornea or lens where the eye cannot focus an image properly on the retina, resulting in blurry vision. Presbyopia occurs with increased age and results in the inability to focus on nearby objects, often making reading difficult. 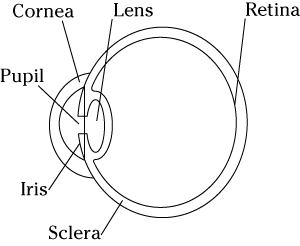 The figure depicts the basic anatomy of the human eye. Anatomy of the human eye. There are multiple viewpoints on the causes and proper treatment of poor vision, two of which are explained here. Vision problems in humans are hereditary and occur regardless of environmental factors. Vision exams should be conducted on children beginning at a young age so that issues can be identified early. The best solutions available to treat vision errors include eyeglasses, contact lenses, and eye surgery. These treatments quickly correct the majority of vision issues and have been used for centuries in the past, as shown in artwork and literature. More recently, contact lenses have been used as a convenient solution for vision correction, providing an additional treatment option to those with poor vision. Additionally, laser eye surgery has been shown to be a long-lasting solution for refractive vision errors. Poor vision is a result of improper use of the human eye. When one focuses for too long on nearby objects, such as books, televisions, or computers, the eye is weakened, and this leads to vision errors. When these issues are corrected through artificial vision correction devices, such as eyeglasses and contact lenses, the eyes adapt to this handicap and are allowed to degenerate further, causing the vision problem to worsen. Human children who spend a great deal of time focusing their eyes on nearby objects rather than playing outside are much more likely to develop vision defects early on in life. Humans who make a habit of not focusing on nearby objects experience much fewer cases of poor vision. A more natural and healthier solution to vision problems is learning to properly exercise the eyes and to reduce time spent focusing on nearby objects. Many people with vision errors such as myopia and astigmatism have been able to correct or greatly reduce their refractive error through exercising the muscles around their eyes. This exercise, combined with giving the eyes proper amounts of relaxation, serves to prevent as well as reverse common vision errors. (A) vision problems can develop at any time during life. (B) children’s vision is not affected by watching television. (C) laser eye surgery is a permanent solution to vision errors. (D) vision problems cannot be reversed, only prevented. According to the genetic theory, which of the following humans is most likely to have a vision error? For this question, just look closely at the environmental theory to see which choice it supports. Choice (A) is correct because the environmental theory says that vision errors result from focusing too long on nearby objects, which is something that could happen at any time in life. Choice (B) is incorrect because the environmental theory makes the exact opposite claim, stating that watching television affects vision. Choice (C) is incorrect because the environmental theory doesn’t support laser eye surgery. The theory also supports the idea that vision problems can be both prevented and reversed, which makes Choice (D) incorrect. The correct answer is Choice (H). The genetic theory supports the idea that vision problems are hereditary and can’t be changed by using eyes in a certain way. Choices (F), (G), and (J) all talk about a specific use of one’s vision, which isn’t part of the genetic theory.